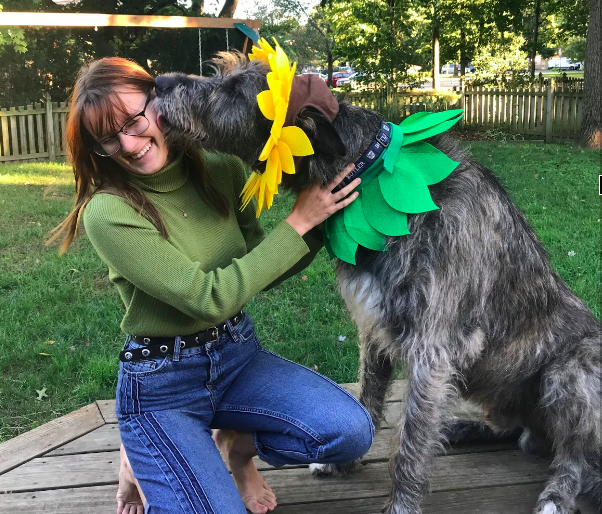 Abby Pluff and her good boy Fionn. Photo courtesy of Abby Pluff. I’m going to be honest, when we decided to get another dog, I wasn’t sure you were what we needed. You were so cute, and we all know I have constant puppy fever. But our other dog Lucy, who I’d had my whole life, had just passed away and I was convinced that I could never love another dog as much as I loved her. You won my heart the first time I saw you, though. You were so small and fluffy, and already learning to sit instead of jump. You had changed my heart but not my mind yet. When we officially got to bring you home in the summer of 2017, you curled up on my lap for the entire three-hour ride. We napped together, and you kept licking my nose as if you could sense I wasn’t quite sure about you. You were trying to change my mind. Within our first three months together, you accomplished just that. While Mom was at work, you and I got to spend a lot of time together, just the two of us. You woke me up in the mornings, cuddled me all day, ate when I ate… and sometimes what I ate, too. Mom, don’t read this. We spent the whole summer before I left for college basking in the sun and relying on one another for company. That summer, you taught me how to love. The way you looked at me with those huge puppy-dog eyes taught me that love was unconditional and endless. You taught me my love for one dog cannot steal from or diminish my love for another. We honored Lucy’s memory together: getting pup cups, walking at the park, and cuddling before bed. Even though you never knew her, it made me feel better knowing we were doing things she would enjoy. I’ve learned how to take care of someone who can’t fend for himself. You taught me to be in tune with another’s needs, and to put myself both first and last. Your love taught me no matter what I have done or will do, I have someone in my corner. Some days, when my anxiety gets the best of me, you know just what to do. You give me huge doggy hugs and knock me over with your overzealous kisses. The nose kisses are my favorite. Because I’m so small and you’re so large, you don’t even need to try to reach! You seem to know those always make my mood turn all the way around. When I’m angry, you’re always the first one on my side. Because you’re such a gentle giant, you never growl or bark, but you always take one step in front of me to protect me. You bring such joy to my life. You make me laugh hysterically. The countless times you’ve taken a drink of my coffee in the morning, just to decide once again that you don’t like it, makes me giggle even thinking about it. Your willingness to try anything I like reminds me that it is important to experience everything I can in the pursuit of happiness. Watching you run around makes me feel like I’m free. You are so clumsy and yet look so much like you’re flying. The enjoyment you draw from being outside reminds me that in simplicity are life’s greatest pleasures. Our morning routine brings me so much peace. When I lived at home, you’d lay outside the bathroom and peek in through the open door, watching me do my makeup. When I’d ask your opinion on which eyeshadow palette to use, you’d helpfully nudge the one you preferred with your big ol’ nose. My sweetest Fionn, you have changed every facet of my life. Leaving for college after spending so much time taking care of you was a major adjustment. You occupied so much of my time and attention at home, I felt aimless taking care of only myself. It’s all worth it for the reunions, however. Everytime I come home, your pure excitement and love reminds me that sometimes coming back together makes the distance worth it. Fionn, you are my puppy soulmate, and I love you with every fiber of my being.